The Mason jar is the new adult lunchbox. Mason jar recipes are the newest answer for not having time to prepare a healthy lunch for work. It is a crafty glass container that is super easy for storing your lunches for work. Mason jars were named after—you guessed it! A man named Mason. John Landis Mason invented and patented the molded glass jars in 1858, as a home canning method to preserve food. Fast forward nearly 160 years, and many are discovering a fun, new, and safe way of storing lunch at work, or even dinners for the next day. Is making lunch for the next day is problem for you? For many eating at work is an afterthought, and some hardly find to eat at all. Your meal should be exciting, and you should look forward to eating it. Hey, listen, I know you’re busy at work, but that doesn’t mean you shouldn’t deprive yourself of healthy lunch. What a Mason jar does, is it allows you to make hearty salad or meal in about 10 to 15 minutes. In less than an hour, you will have a Mason jar meal ready for each day of the week. The tight-fitting lid will minimize contamination, and keep the food from going bad for up to five days in the refrigerator. Simply, grab one before you head to work, and there you have it—your lunch is packed! There are many different ways to make a Mason jar salad or meal. How do you build a Mason jar salad? There is a basic formula that prevents your salad from getting soggy. Then, once you’re ready to eat, shake up the Mason. You can empty all the Mason jar ingredients into a bowl, or eat it straight from the jar. It is that easy! Now, here are some Mason jar recipes you can try. 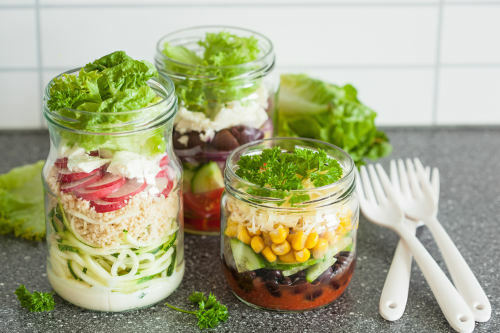 These Mason jar recipes for salads will keep lunch interesting and fun. You will also likely make your co-workers jealous, and possibly curious about making these portable lunches as well. Arugula and watermelon are quite refreshing together. The following recipe will make for a perfect work lunch, or take it along for a picnic when the weather is nice. The Mason jar recipe listed below will take only about 15 minutes to prepare. Shake together all salad dressing ingredients, and divide dressing with two tablespoons at the bottom of each Mason jar. Add all the salad ingredients in the following order: watermelon, feta, almonds, mint, and arugula last. When serving, shake ingredients out into a bowl, and enjoy. Salads taste better when creamy. This Mason jar recipe features an avocado hummus that will now be part of your weekly routine. Overall, the following salad is pretty well-rounded with an assortment of colorful vegetables and plant-based foods. To make the hummus, place the chickpeas in a food processor, and pulse several times to begin pureeing. Add the olive oil, tahini, lemon juice, and garlic, and pulse again until almost smooth. Then add the avocado, and pulse until completely smooth. If desired, add the cumin or cayenne pepper, and blend again. Taste, then season with salt and additional lemon juice, and blend again. Transfer the hummus, to an airtight container and drizzle with olive oil to help prevent from browning. Refrigerate until you are ready to use. To assemble the salad, add the shredded veggies to a medium bowl, and drizzle with two teaspoons of lemon juice, toss, and set aside. Add the olive oil, one tablespoon of lemon juice, and quinoa to the jar, and top with veggies, avocado hummus, olives, greens, and nuts and seeds. Tighten the lid, and refrigerate until ready to eat. Do you want the flavors of Mexican food at work? This Mason jar Tex Mex quinoa salad will surely satisfy that craving. The following recipe is good for four Mason jars. So, bring some for your friends, or have Tex Mex for four days in a row. For the dressing, place all the ingredients in a small food processor, and process until smooth. For the salad, layer the Mason jar with three tablespoons of the salad dressing, then a handful of spinach, a quarter cup of tomatoes, a half cup of quinoa, a quarter cup of black beans, a quarter cup of corn, and a half sliced avocado. Repeat three more times, for more Mason jar lunches. Want a quick and nourishing salad at work? The following Mason jar recipe is good for one person, and the flavors are simple, and easy to assemble. For the dressing, whisk together all dressing ingredients in a small bowl. For the salad, layer two tablespoons of the salad dressing and chickpeas in a large Mason jar. Next, layer the beet, pecans, spinach, cranberries, pepper, and onion. Black beans, kale, and zucchini combine for a whole new experience in Mason jar salad form. This Mason jar recipe is loaded with flavor, and also includes broccoli, green peas, sweet potato, and pumpkin seeds. It is quite the meal for lunch. Just hide it at the back of fridge, or it might not be there come lunchtime. For the dressing, whisk all the dressing ingredients in a small bowl. For the salad, add two tablespoons of the dressing, then layer the black beans, zucchini, sweet potato or butternut squash, kale, green peas, broccoli, pumpkin seeds, and green onion. Sometimes we have even less time to prepare lunch than we want to. The following Mason jar salad recipe fits that profile. It will also make three Mason jar lunches that can be used for later in the week, or for others in your household. For the dressing, combine the dressing ingredients and whisk. Pour a third of each mixture into each Mason jar. For the salad, rip the lettuce into bite-sized pieces. Add the carrots, celery, and cucumber to the Mason jars, and top with the lettuce. A superfood Mason jar detox salad is a perfect way to reset the body. It has a lot of tasty ingredients like broccoli, carrots, quinoa, and goji berries; however, the blueberry hemp seed salad dressing is what really makes this Mason jar salad. Give the recipe below a try, and you’ll see! The following recipe makes for four Mason jar salads. For the dressing, combine dressing ingredients in a food processor and blend on high until smooth. For the salads, layer the ingredients from bottom to top: three to four tablespoons of dressing, a third cup of broccoli, a quarter cup of sliced radishes, a third cup of shredded carrots, two tablespoons of goji berries, a third cup of cooked quinoa, two tablespoons of sunflower seeds, and the rest with kale. Screw the lid on tightly, and store in the fridge for up to four days. Want a salad with more protein? Try adding a hard-boiled egg and turkey to the mix. For this Mason jar recipe, we will keep it simple. You will only need to use balsamic vinegar or olive oil. This recipe is as simple as the come, and it will surely fill you up until dinner. For the salad, layer the Mason jar with the olive oil or balsamic vinegar, followed by the cucumber, celery, carrots, tomatoes, artichokes, egg, and apples. Then add the turkey and then the greens. For this Mason jar salad recipe, you will marinate chicken in an sriracha-pineapple mixture. If you’re looking for boring, this definitely is not, but it will take a little longer to make this recipe. That being said, it will be worth it. Place all marinade ingredients into a blender or food processor, and blend until smooth. Coat the chicken in the marinade, and let it sit in the fridge for an hour. On a barbecue or grill pan, cook each side of chicken for four to five minutes, or until the center is no longer pink, and set aside to cool. Once cool, cut into chunks. Divide ingredients evenly between two Mason jars. Mix together salad dressing ingredients, then divide in the Mason jars. Then place avocado, tomatoes, pineapple, chicken, and then spinach, and onion. Mediterranean salad couldn’t be made any easier. The following Mason jar recipe is full of nutrition, and contains a variety of vegetables and other nutrient-dense ingredients. There isn’t a lot of prep for this final recipe. It is pretty much all about chopping ingredients, and putting them in a jar. A handful of mixed greens, and a sprinkle of dried thyme and oregano. For the salad, layer with balsamic vinegar, artichoke hearts, black olives, tomatoes, cucumbers, cannellini beans, nutritional yeast, feta cheese, pine nuts, greens, thyme, and oregano. Screw the lid on tightly and store in the fridge for up to four days. Mason jar recipes are a great way to eat healthy and save money. There are also benefits to storing your lunch in a glass jar instead of a plastic container, too. For instance, chemicals from plastic containers may leach from the plastic into your food, especially if you are heating your food in the microwave. You will also save time getting your lunch ready at work. All you have to do is take it from the fridge, transfer to a bowl, and start eating. Or, you can just eat it straight from the Mason jar. No microwave required. Werner-Gray, L., 10-Minute Recipes: Fast Food, Clean Ingredients, Natural Health (Australia: Hay House Australia, 2016), 112-114. McCarthy, J., Joyous Detox: Your Complete Plan and Cookbook to Be Vibrant Every Day (Toronto: Penguin Group, 2016), 188-191. Prepon, L., The Stash Plan: Your 21-Day Guide to Shed Weight, Feel Great, and Take Charge of Your Health (New York: Touchstone, 2016), 246. Bruno, A., “13 Mason jar Meals That Will Reinvent Lunchtime,” SELF, February 25, 2016; http://www.self.com/gallery/13-mason-jar-meals-that-will-reinvent-lunchtime. Sugar, J., “25 Mason-Jar Salad Recipes to Make Co-Workers Jealous,” PopSugar, December 25, 2015; http://www.popsugar.com/fitness/Salad-Jar-Recipes-35452622#photo-35452622. Cogswell, V., “13 Healthy Mason Jar Meals (Don’t Leave Home Without Them),” LIVESTRONG, January 3, 2017; http://www.livestrong.com/slideshow/1011311-13-healthy-mason-jar-meals-dont-leave-home-them/. McDonald, L., “Meal Prep Tip: Mason Jar Salads,” Balanced Life-Leslie, July 11, 2016; http://www.balancedlife-leslie.com/meal-prep-tip-mason-jar-salads/. Coleman, C., “Mason Jar Salads,” The Holistic Honey, April 9, 2014; http://theholistichoney.com/mason-jar-salads/, last accessed February 9, 2017. Fraser, C., “5 Healthy Mason Jar Salads You Can Pack for Lunch This Week,” Live Love Fruit, May 27, 2015; http://livelovefruit.com/5-healthy-mason-jar-salads/. “15 Quick and Healthy Mason Jar Recipes for Breakfast Lunch and Dinner,” Healthy Holistic Living; http://www.healthy-holistic-living.com/15-quick-and-healthy-mason-jar-recipes-for-breakfast-lunch-and-dinner.html, last accessed February 9, 2017. “Arugula and Watermelon Salad in a Jar,” Sweet Peas & Saffron, July 8, 2015; http://sweetpeasandsaffron.com/2015/07/watermelon-feta-and-arugula-mason-jar-salads.html. Johnson, L., “Rainbow salad in a jar with avocado hummus,” Oh My Veggies, September 4, 2014; http://ohmyveggies.com/rainbow-salad-in-a-jar-with-avocado-hummus/. Hersh, L., “Mason Jar Tex Mex Quinoa & Tangy Cilantro Lime Creamy Dressing,” Fit Foodie Finds, July 27, 2014; http://fitfoodiefinds.com/2014/07/tex-mex-quinoa-tangy-cilantro-lime-creamy-dressing/. “The Ultimate Superfood Detox Mason Jar Salad,” FitLiving Eats; http://fitlivingeats.com/ultimate-superfood-detox-mason-jar-salad/, last accessed February 9, 2017. “TROPICAL SRIRACHA CHICKEN SALAD + 6 HEALTHY SALADS IN A JAR,” The Healthy Maven; http://www.thehealthymaven.com/2015/04/tropical-sriracha-chicken-salad.html, last accessed February 9, 2017.